Pay examination fee through online Credit card, debit card and online banking. Note : अगर आप सभी प्रतियोगी Students को “UPSSSC Bharti 2018” से सम्बंधित कोई भी जानकारी चाहिए तो आप हमसे संपर्क कर के पूछ सकते है| हमारी टीम जल्द ही आपकी मदद करेगी. ccc aniwary hai, without ccc, you can’t apply.. I am B. Tech in Computer Science. Can I apply? I have not CCC. 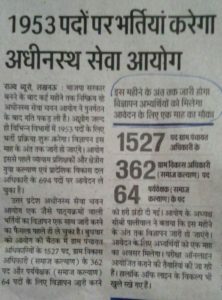 SIR UPSSSC SE JO ITI ANUDESHAK KI 253 BHARTI AAI THI USKA KYA HOGA…..
CCC certificate verification ke time hona jaruri hai..
Prashantji, aap exam dijiye, ho sakta hai us samay aayog ‘O’ Level/PGDCA ko manya kar de..
Rohit, ‘CCC’ Certificate during Application form last date se pahle ka hona chahiye..
Sir mera CCC ka result 25 June 2018 ko nikla h aur hm vdo ka form apply kr diye h to hm exam de skte h hm eligible h ?? Anushka ji, You are eligible for VDO, becuase Your ‘CCC’ certificate under application form submission date.. Document Verification ke time problem hogi..accept nahi karenge…aise aap exam dijiye UP Govt. Kuch bhi kar sakti hai..
Rahman ji app Exam jarur de..
Sir mere pass 11th 12th m computer science thi ccc nahi ye chle ga ..
ccc necessary hai…aap ccc bhi kar lijiye..
Rohit ji many hona chahiye..